Canyon Shores Tennis Resort Condominiums is a 202 unit, gated, resort community. Located in Cathedral City (across the street from Palm Springs). Visitors consistently comment upon the beautiful grounds and the level of maintenance. Canyon Shores is a series of waterfalls, streams and lakes amongst the lawns, the Palm trees, annuals and bougainvillaea. You won't miss home. This spacious 1,330 SF unit is not a rental but our second home. It was completely repainted, re-carpeted and new tile installed throughout 11/2010. The unit has two flat screen TV's in the Living Room and Master Bedroom. It is fully equipped and furnished. Wifi, upgraded cable TV and house phone. Fully equipped just bring your clothes, golf clubs and tennis racquets and your ready to go. Oh, don't forget your swim suits as we have five pools to choose from. This is a ground floor unit that faces SW so patio is sunny and warm. Reserved covered parking just outside the front door. Keywords: Ground floor tennis resort condominium, 2/2, fully furnished and equipped, patio has sunny southwest exposure, not just a rental this is our second home. I'm a commercial real estate broker in the Seattle area. Linda's a retired school teacher. I love the on site tennis, the courts are in perfect condition, and there are three super public golf courses within 10 minutes. She loves the shopping that is within ten minutes, is endless and in every price range. We find Cathedral City centrally located and close to a lot of amenities. This is a vey social place if you want it to be. You will love the people you meet at Canyon Shores. Lots of professional people like medical doctors and dentist, small business owners, corporate managers, teachers and school administrators, engineers, real estate agents mixed with some full time residents. We rented in numerous complexes in the valley and some places didn't feel welcome (made to feel like 'renters') We rented here for three years and got to love the place and the people. So we bought. Will have all new stainless appliance by 12/2012. Baby it's warm outside, she likes the pool and gabbing with the gals. I like to play tennis and there's lots of golfers. Canyon Shores is a very social place. We like that. Five lighted tennis courts in perfect condition, no charge, full time tennis pro ($20/hr for lessons) five swimming pool complexes, each with spa. Canyon Shores is a series of lakes flowing into a water fall along a stream and into another lake. Landscaping is very nice with flowers, lots of lawns and Palm trees. Some citrus. Grapefruit is ripe in winter months. 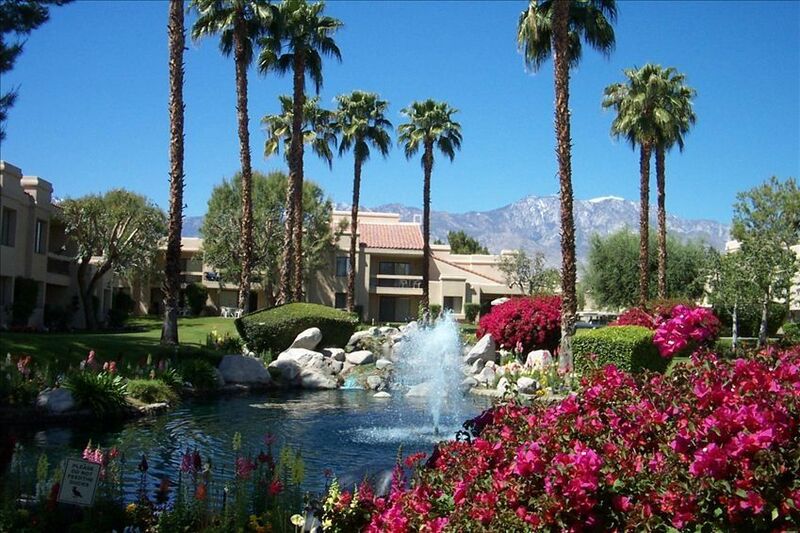 Canyon Shores is located in Cathedral City which is between Palm Springs and Rancho Mirage. The Coachella Valley is comprised of the cities of Palm Springs, Cathedral City, Rancho Mirage, Palm Desert, Indian Wells, LaQuinta and Indio and generically known as Palm Springs. We are 4 miles from the airport and centrally located in the Coachella Valley. Canyon Shores southerly location shields it from the winds that northerly sites are subject to. Unit has southwest exposure for sunny patio 9am-5pm. Nicely equipped fitness center in clubhouse. No pets. The pricing is for two guests. Each additional guest is $100 per month to a maximum of five total guests. Cancellation Policy: 100% refund of Damage Deposit and any portion of your time that can be re-rented. If you need to cancel I will immediately re-post to VRBO and numerous Craig's Lists sites but if you need to cancel inside 60 days it is difficult to re-rent as most people do not plan a one or two month vacation at the last minute. Payment is by personal check. If you desire payment via a bank card there is an additional 3% fee.